Absolute Beachfront Getaway at Moana. This fantastic two level Executive Beach House with Spa Bath and private balcony, is situated right on the beach at Moana Beach. The Beachhouse has 3 Large Bedrooms with an added Private Family Room which has a large double Sofa bed. Balcony with views & table setting. 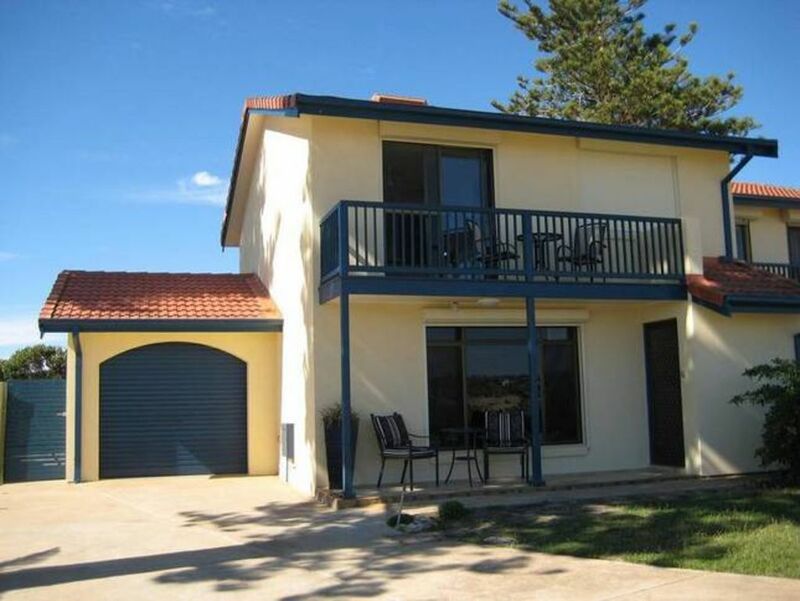 Absolute Beachfront Getaway is a fully self contained Holiday House, with Leather Lounge, 50" Plasma TV, Free Foxtel, DVD Player, CD stereo, Dishwaher, Microwave, Fridge/Freezer, Spa Bath, Washing Machine, Dryer, 4 Burner BBQ, an Outdoor Setting for 8 w/ Umberella, & outside shower for your convenience. Sit outside on the veranda and enjoy the sea views & beautiful sunsets. It is a comfortable 25min drive on the Southern expressway from the CBD of Adelaide. We are Absolute Beachfront (no roads to cross) with one of the best beaches in Australia, right on our doorstep & with the best sea views, and sunsets. For your convenience a two min drive will take you to the Seaford Shopping centre where you will find Big W, Woolworths & Foodland Supermarkets, Fashion stores, Shoe shops, Cafes, Restaurants, & Food Shops. So close to everything. But most importantly, walk out of your Beach House and straight on to the dosen't get better than this. For your stay we have supplied 1 x Beach umbrella, & an Ice Cooler for your drinks. Paved walking tracks along the coast, and surrounded by great boutique wineries, great restaurants, cafes and food shops. Stay right on the Beach with no roads to cross. We also offer three Executive Homes in the heart of the CBD. "Angas Street Executive Terrace House"
All our magnificent homes are on the Stayzs website. Google names for photos and contact information. We can cater for all your Holiday and Business needs. The unit was excellent - nicely appointed, convenient for everything we wanted from our visit to southern Adelaide. And, of course, very dog friendly! We have booked a few places at Moana Beach in the past and this home is by far the most superior we have stayed in. It accommodated two families effortlessly and the luxury decor and surroundings that it offered were really appreciated. Angela was a delight to deal with and nothing was too hard. The children loved the Boogie Boards and the Family games provided not to mention the Foxtel and the absolute access to the Beach. No cars or roads to worry about.A spectacular place to spend quality family time.We will spread the word and certainly return. what a great place, everything there we needed to accommodate the 6 kids we took along. The beach was beautiful and the playground next door with BBQ was handy.Thankyou Angela,beautiful home. We will be back! Very relaxing, even during winter.Facilities very good, very convenient to beach. Great facilities and plenty of room for all the family. The dog loved it too. The view and the beach were fantastic.